by their house for the supplies for this project. My head was spinning...I had so many ideas. I had a vision (sort of)...and now I had the supplies. 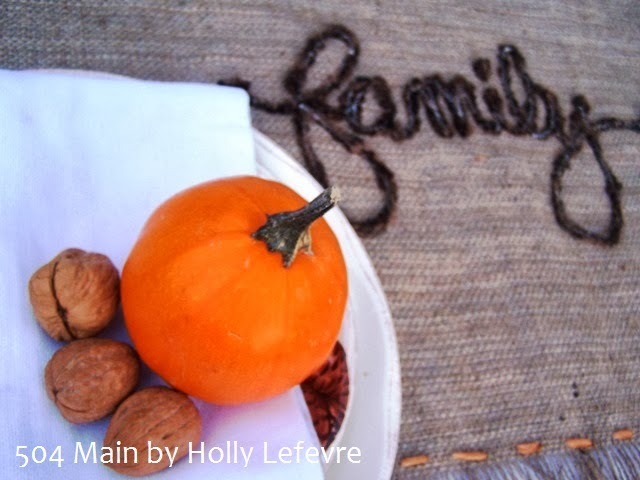 At my house, the kids are in charge of decorating the Thanksgiving table. and love seeing how proud they are of their creations. I do, however, get to decorate a table...just not mine! 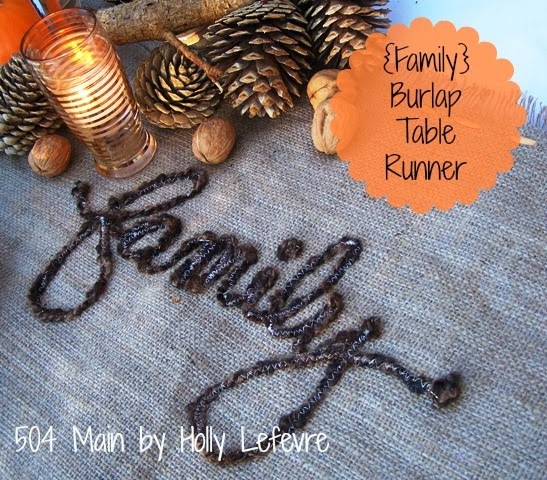 The runner is pretty simple...and so is the technique I used to embellish it...the possibilities are endless with this technique (just wait until you see my next projects!). As I mentioned I purchased my supplies at Jo-Ann Fabric and Craft Stores. Be sure to check out the Jo-Ann Craft Catalog for fabulous holiday ideas to DIY, great gifts...and coupons (and be sure to visit the bottom of this post for a GREAT coupon!). Jo-Ann Celebrate The Season is also an amazing source of holiday inspiration! The "word" you want to transfer. I used FAMILY. 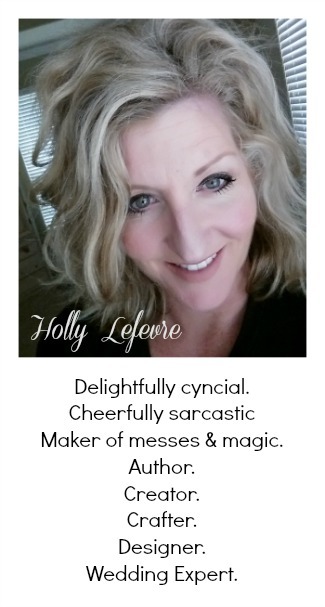 Here is the printable (my handwriting). You just size it as needed to fit your needs. NOTE: You can use any font you desire...but the more fluid and not-too-fussy fonts work the best. 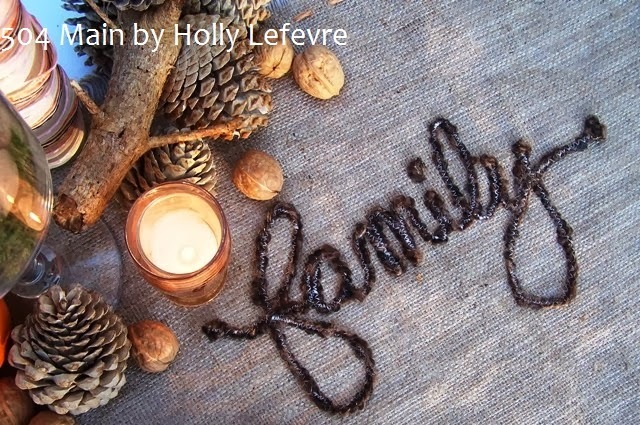 TO SEW by hand: Embroidery floss and needle in desired color and the knowledge of a chain or running stitch. To determine the yardage, measure the length of your table and then add 8-10 inches for overhang on BOTH sides. Determine your width (you can actually get 2 runners from your length of burlap yardage, by cutting down the center, yields 2- 24" runners). 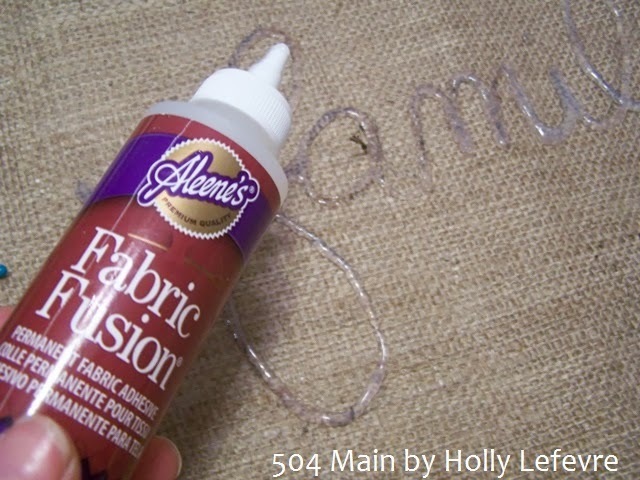 BE SURE TO READ THIS BURLAP CUTTING TIP! 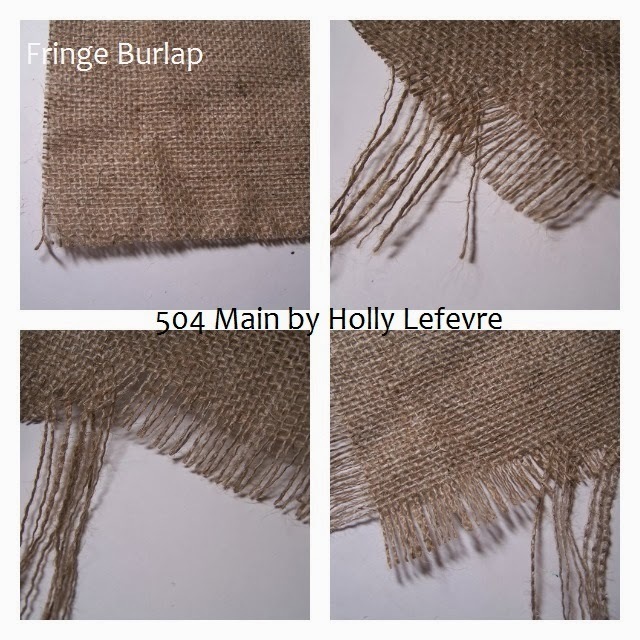 Before you cut, determine where you want to make the cut (mark it with a contrasting color if you need too); grab the thread/fiber of the burlap at that point, and pull...you may have to smooth your "ruffle" out as you pull. Essentially, you leave a void in the space where that thread was and can easily cut a straight line. Ta-Da! 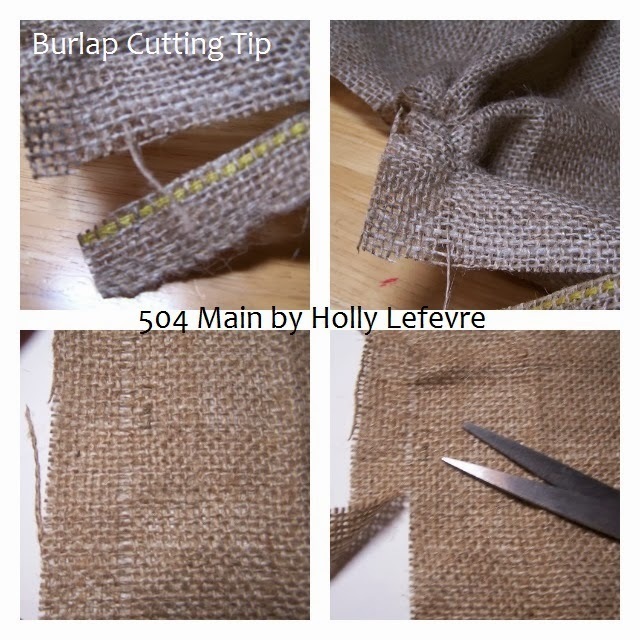 Step 1 - Cut the burlap to your desired length (seriously use the tip above - it makes it so easy). 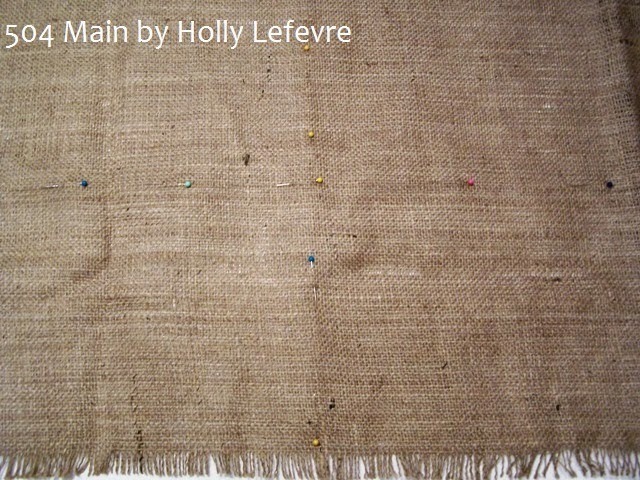 Mine is 92"
Step 2 - Cut the burlap to the width you desire - Be sure to account for any fringe like I have. For example, I want my runner to be 22 wide with 1" of fringe all around (24" TOTAL). Pull out your thread to make the full cut. Step 3 (Optional) - Once the runner is cut out, then measure up 1" (or desired length) and CAREFULLY remove those threads (I removed about 8). Start by pulling a few at a time. The burlap will still fray so go slow and be cautious. Step 4 - Thread the ribbon onto your needle and knot at the end. 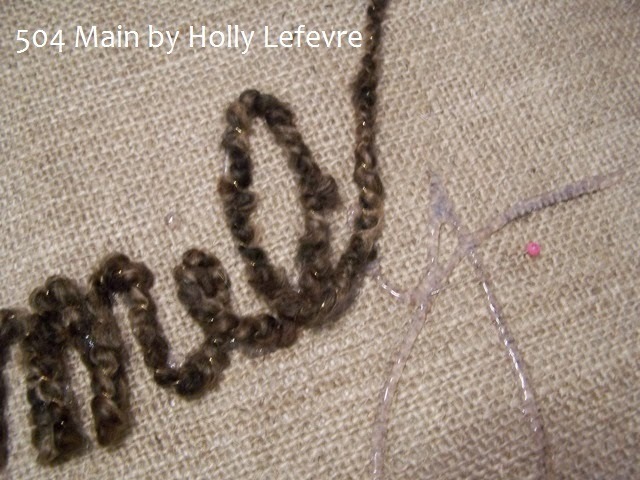 Began at one corner, and run a stitch about 1/2" up from the solid (not the frayed) edge. 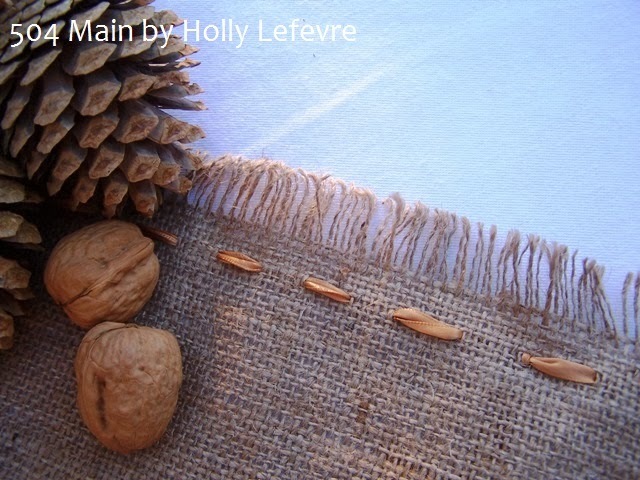 My stitch is not perfect...and it is not supposed to be...just sew! Step 2- Find the center of your runner. I folded the runner in half lengthwise (matching the ends) and marked the center with straight pins. Then I folded it in half width and did the same. 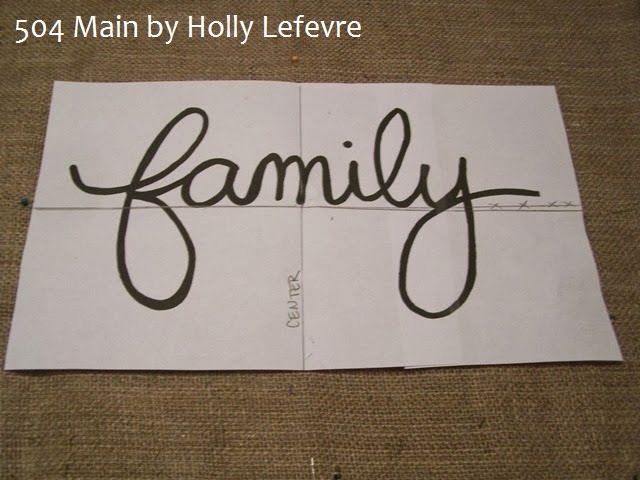 Step 3 - Find the center of your WORD - I folded mine in half matching up the F and Y. I also marked a straight line where the words rest evenly to match to my lengthwise center line. Step 4 - Match the WORD center points to the center point you marked on the runner. PIN the paper into place on all four corners. Step 5 - Insert carbon paper, carbon side down, under the paper (sandwiched between the runner and paper). Step 6 - Before transferring the image or gluing, protect your work surface. 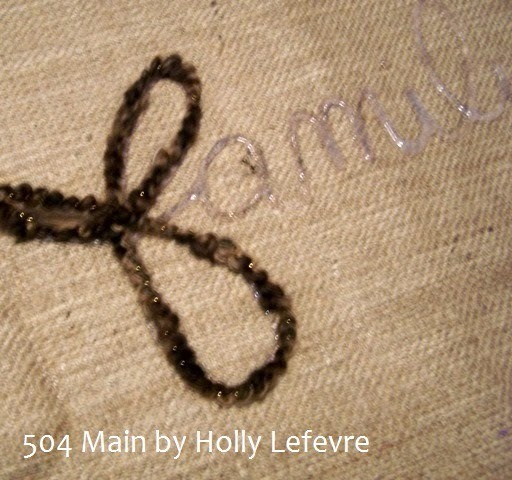 I worked on a mat and I place waxed paper under my "embellishment" area. Step 7 - Using a pencil trace the WORD onto the runner. 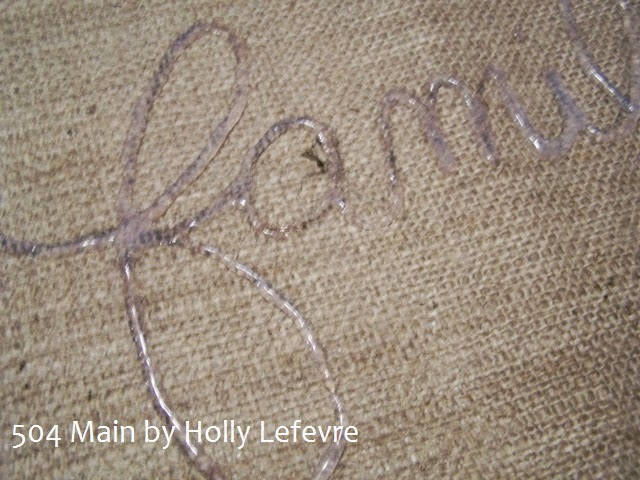 Due to the rough nature of the fabric, I went over my word numerous time to get a good line on the burlap. 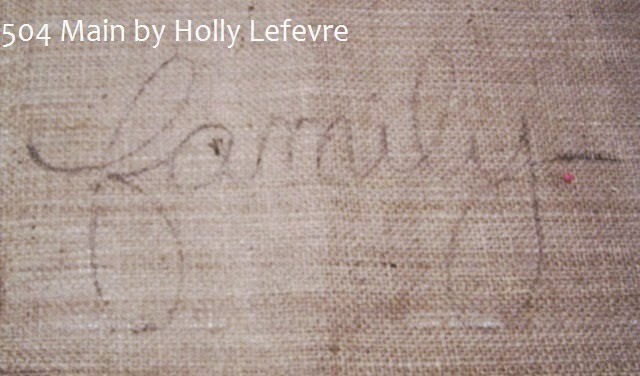 This is the carbon paper transfer on the burlap. 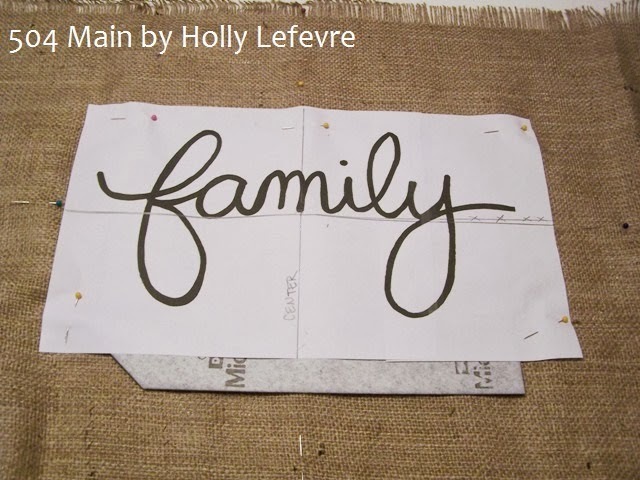 Step 8 - Use the Fabric Fusion and trace the letters with the Fabric Fusion. Step 9 - Cut a length of yarn a few yards long. Tie one end with a few knots. Step 10 - Place the knot at the beginning of the F (flair), then carefully follow your traced/glue lines with the yarn, slightly pressing down to get it to adhere. At tine you may have to double over an area (like you are writing...but that is OK). When you get to the end of the Y, tie more knots again. Step 11 - Lightly press the yarn into the burlap by tapping your palms down. Step 12- Let dry - mine took overnight. Step 13 - ON THE SEWING MACHINE: I chose to use a zig zag stitch. Start on one end, and using a zigzag stitch follow the lines of the yarn. 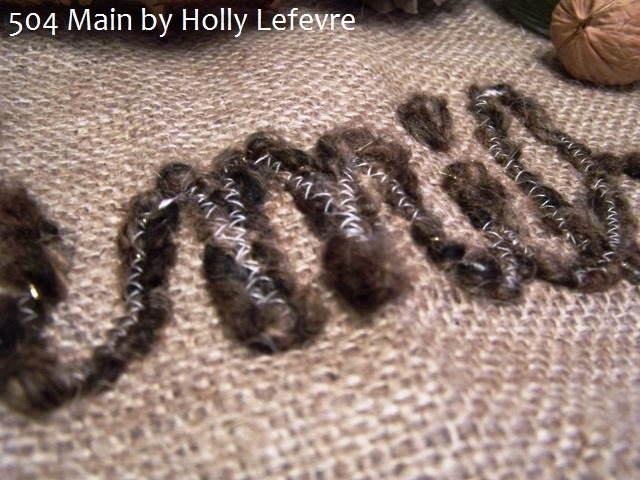 MY ZIG ZAG STITCH IS NOT PERFECT AND THAT IS OK AND ON PURPOSE...IT'S A STYLE THING! As you go along the yarn, you may need to stop, pick up the presser foot and turn/manipulate the runner to sew. I did my zigzag right on top of the yarn. My machine had no trouble going through the yarn (with the glue under it). If you have to stop - stop and start again...the irregularity in the stitches make it look even better. 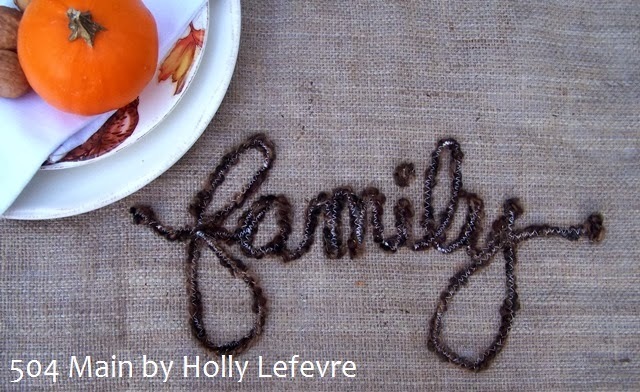 OPTIONAL: NO SEWING Machine...Grab you embroidery floss, using all the strand and thread a needle. 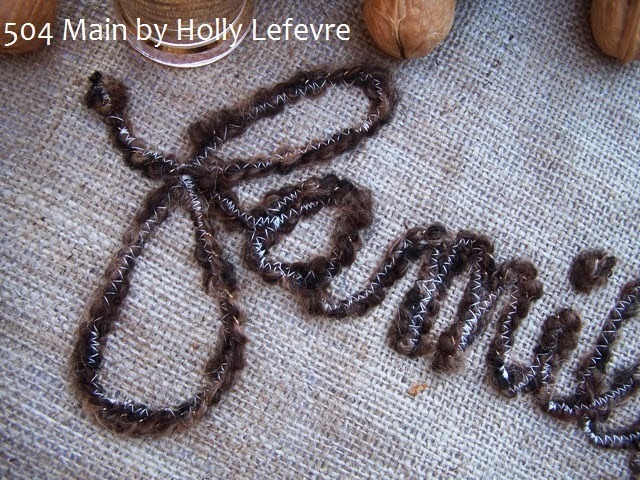 Do either a running stitch or a chain stitch and stitch down the "center" of the yarn word. 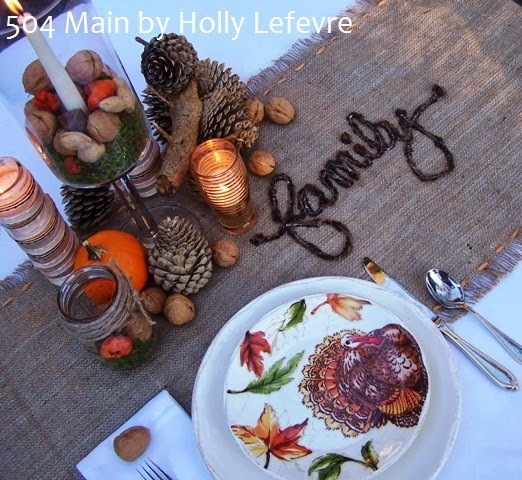 So...are you ready for Thanksgiving? Are you inspired to whip up an amazing runner for the big day? This took me less than one hour (not including the drying time for the Fabric Fusion). and there's a coupon (at the bottom of the post) to get you started! Enjoy the time with your family and friends this holiday season! Very cute Holly. I like this technique. Now I have projects jumping around in my mind! Holly I LOVE this so so so much!!! Beautiful! Beautiful! I love the rustic elegance of this piece!